Teeth are a complicated part of our bodies. While some of us seem to be blessed with naturally healthy teeth, others of us seem predisposed to dental problems and as such, damage and decay are a virtually unavoidable part of life. Modern dentistry has come a very long way, but unfortunately there are still occasions when a tooth is so badly damaged that it cannot be saved. This once would have meant leaving you with an unsightly gap in your smile. The more teeth you needed removed, the greater the number of gaps you would have had, which would have affected not only your confidence, but also the overall functionality of your mouth and jaw. However, thanks to innovations in dentistry there is now another option – dental implants. Dental implants are the latest way of replacing teeth that have either fallen out or need to be removed. Titanium screws are inserted into the jaw where they are left to fuse with the bone in a process called osseointegration. Once this has happened, a crown can be secured to the implant using a fixture called an abutment. Once the complete implant is in place, you will be able to use your mouth, teeth and jaw as normal. The popularity of dental implants has risen steadily over the last few years, and this is largely because of the huge number of benefits associated with them, compared to earlier solutions such as dentures. A dental implant is the nearest you can possibly get to natural teeth. Osseointegration ensures that the titanium implant rod is secured to the bone, making your implant extremely stable and strong. Patients of Dr. Alex Afsahi who receive implants expect full functionality from their teeth, mouth and jaw within just a few days of the procedure being complete. The crowns that make up the visible portion of your replacement tooth can be color-matched to your other teeth, giving you a natural-looking smile that you can be confident to share. People with too much space in their teeth often find that their teeth may move around. This can create further dental problems if they move too far or impact on any of the surrounding teeth. 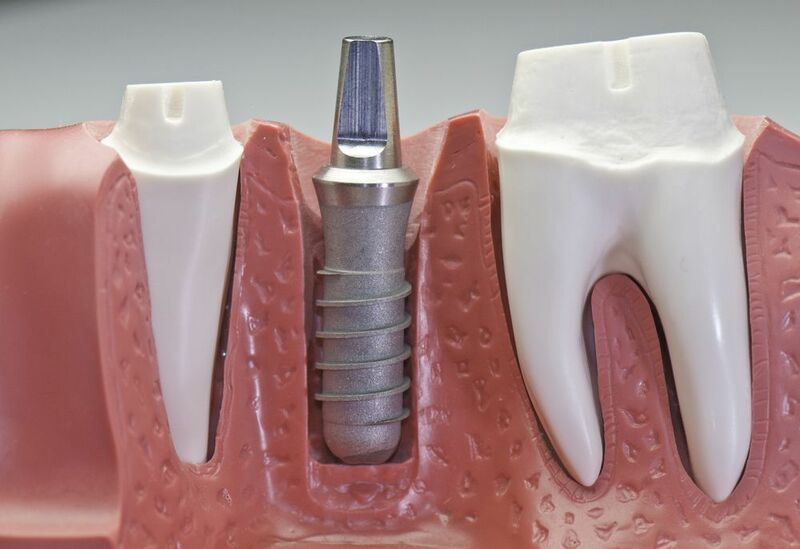 Implants fit snugly into the gap that you have, which will help prevent other teeth moving into it. Missing teeth can sometimes cause your face to change shape, sag and appear sunken and older than it is. Great-looking teeth provide a youthful quality and will give you a stunning smile. Eat and drink without fearing for your teeth! Dentures are renowned for slipping, and many wearers need to remove them in order to drink and eat properly. However, this is not the case with dental implants, which are a permanent solution and allow you to eat or drink virtually anything that you want to. Although you will still have to take care of any implants that you have, it will be impossible to get any cavities in this particular location. Ask Dr. Afsahi if your usual oral hygiene routine will be sufficient. If not, ask for recommendations as to the changes that you need to make. If you have multiple teeth missing, it is often possible for two or more implants to support more than one tooth each in what is known as an implant-supported bridge. This offers all of the great benefits of single implants such as strength and durability. One of the most popular things about dental implants is that they are so natural that no-one needs to know you have had them unless you tell them! While traditional dental implants require multiple visits to your dentist’s office, some dentists are able to offer a same-day smile service. Call Today’s Family Dental to find out if this is an option. Dental implants actually have the highest success rate of any implanted surgical device at around 98%. However, their long-term success does depend on the patient having a robust oral hygiene routine. With such an extensive list of benefits, it is easy to see why so many people are opting for dental implants. Make an appointment with Dr. Afsahi to see if you are a suitable candidate for this treatment, and start your journey to a confident smile today. ​If you are missing several teeth in a row, a few strategically placed implants can support a permanent bridge (a set of replacement teeth). If you have lost all of your teeth, a full bridge or full denture can be permanently fixed in your mouth with a strategic number of implants.